The shiny new Google Analytics has a completely redesigned navigation system, meaning you no longer need to choose an account and profile, and can jump directly to the reports that are important. Google has introduced a new Home section with a searchable list of accounts. There’s also direct links to various reporting sections to cut down on the number of clicks it takes to get that report. There’s a selection of data visualizations, and you can apply filters on the dashboard to customize the data. Now available from its own tab next to my site on the main menu bar. Under the custom reports tab you can find a list of all the custom reports available for your profile; as well as view, edit or share any report. Not new in itself, but new to Google Analytics, the word cloud visualization function displays words based on their frequency – the larger they appear, the more used they are. 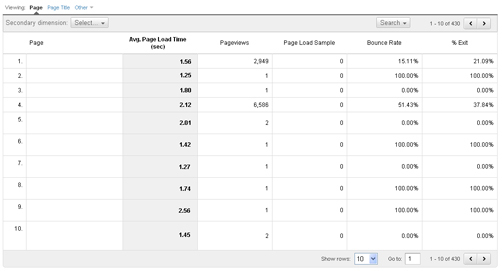 This new feature implemented by Google measures page load times from when a page is requested to when all the elements have fully loaded, allowing you to get a much clearer view of how your site is performing. The traditional method of measuring site load speed was to start tracking once the requested page had begun loading up, whereas Google’s take on this starts tracking once the site is requested. Overall this release is very significant, Google has successfully introduced a much easier to use interface, streamlining the reporting process. The new and improved Analytics is a welcome update for users and the industry in general, and there’s yet more new features to be rolled out over the coming months. Check out the video below for an in-depth walk through, and follow @GoogleAnalytics on Twitter to be kept up to speed on the latest updates. What do you think about Google’s latest offering?